A hospital which has been targeted by thieves and arsonists could be restored to its former glory as part of plans for 90 new homes. Flintshire Council’s planning committee has already approved proposals to turn the infirmary wing of the old Lluesty Hospital in Holywell and surrounding land into 30 properties at a meeting held earlier this month. 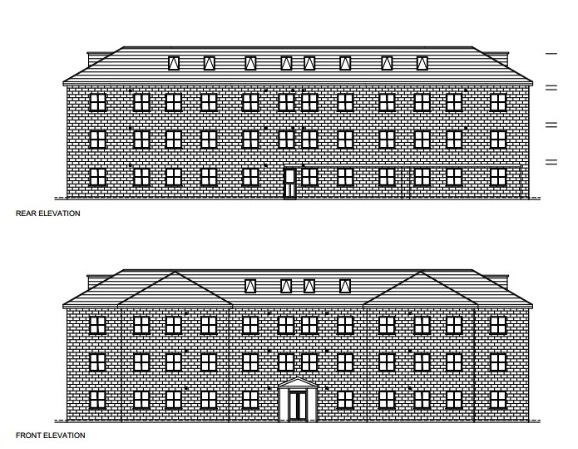 An application has now been submitted to repair a seperate part of the building, including the former workhouse, to be converted into apartments. McCrory Construction also wants to build a number of houses, which together with the apartments would see 89 dwellings created on the site. The local authority has already granted permission for the same number of homes after considering plans by a different firm in 2016. However, after taking on the hospital last year, the company said revised plans were needed because of the ‘urgent’ need to repair some areas. They said: “Since the previous applications were submitted, the Lluesty Hospital site has fallen into further disrepair and dereliction, with theft of roof coverings and lead having taken place across the majority of the buildings, in addition to the breakage or loss of almost all of the historic windows. “Added to this is the vulnerability of the site to anti-social behaviour, with recurring break-ins and damage to internal fabric occurring, including graffiti and arson attacks. “McCrory Construction acquired the former hospital site in 2018 and have taken steps to secure the site by erecting hoarding and employing security operatives during unoccupied periods. The original buildings are estimated to have been built between 1838 and 1840, when the workhouse was first created. It was later turned into a hospital in 1948 before closing its doors in 2008 and has remained empty ever since. The proposed development would see the former hospital and the adjacent chapel, which are both Grade II listed, refurbished with new houses erected nearby. Internally, the company is aiming to sub-divide the buildings to create a series of apartments, as well as constructing a new block to the west of the former hospital. The firm said the plans submitted do not differ greatly to those previously approved. They added: “The proposed works included within this application have been proposed primarily to ensure the historic buildings remain weathertight and resistant to potential anti-social behaviour. “In doing so, it is intended that the levels of deterioration that have been experienced to date will be halted, and the future sympathetic refurbishment will be facilitated. Comments are currently being invited on the proposals via the Flintshire Council website. The authority is aiming to decide on the plans by mid-May.